Follow the latest George H.W. 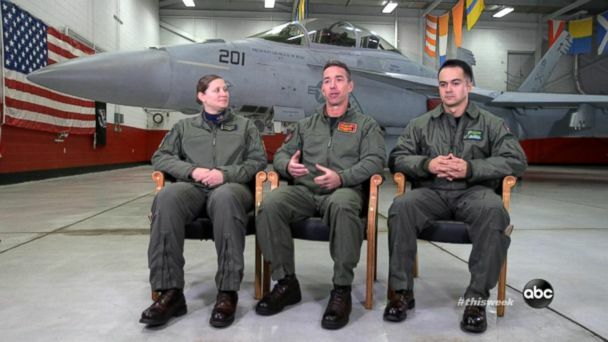 Bush news, videos, and analysis from ABC News. 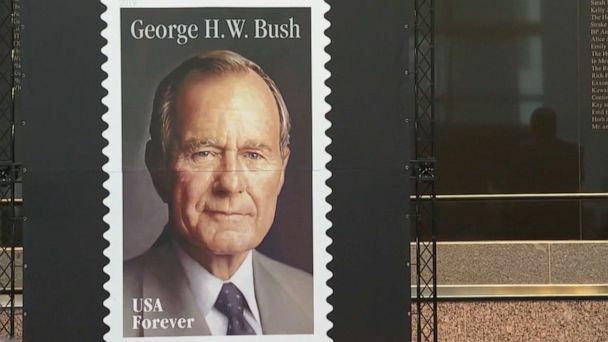 The United States Postal Service is issuing a new commemorative stamp honoring the late President George H. W. Bush, who died at 94 on November 30, 2018. Former President George H.W. 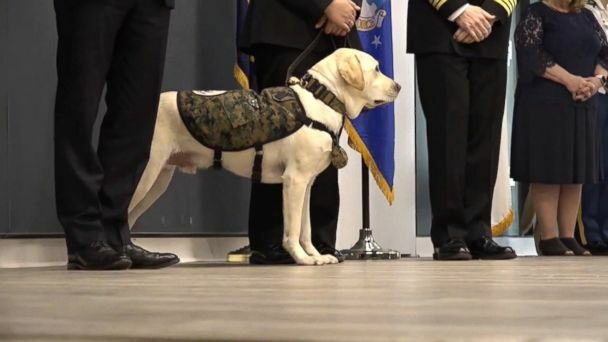 Bush's service dog, Sully, is joining the team of therapeutic dogs that offer comfort at the Walter Reed National Military Medical Center. George H.W. 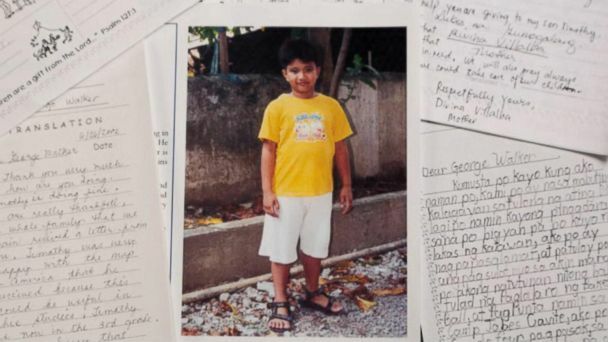 Bush wrote letters to a Filipino boy through Compassion International. 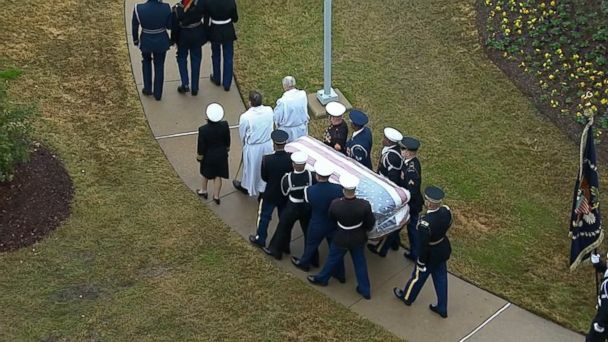 George H.W Bush returns to his final resting place in Texas, where he will be buried next to his wife and daughter. The 41st president will be buried next to former first lady Barbara Bush and their daughter, Robin. The engineer and conductor driving George H.W. 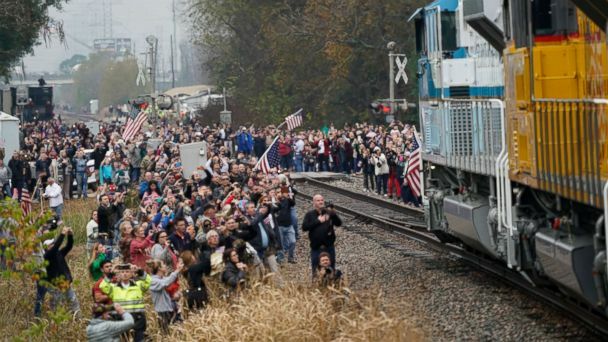 Bush's presidential funeral train are both veterans of the U.S. Navy. Marshall Bush and Barbara Pierce Bush were just two of George H.W. Bush's granddaughters who spoke at the service. George H.W. 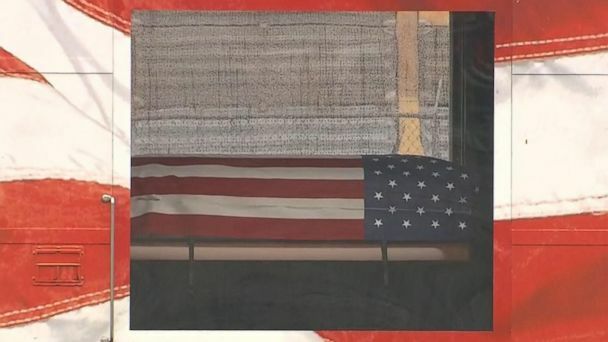 Bush is lying in repose at St. Martin's Episcopal Church in Houston, where he and his wife Barbara regularly worshipped. The 41st president was laid to rest Wednesday at the National Cathedral, where George W. Bush delivered a touching eulogy about how his father showed him "what it means to be a president." In previous ABC News interviews with Barbara Walters and Diane Sawyer, the 41st president spoke about his political life and his sons, George and Jeb. Former presidents, family, friends and former dignitaries gathered at the Washington National Cathedral for the 41st president's state funeral service. ABC News contributor Cokie Roberts joined ABC News’ Chief White House Correspondent Jonathan Karl and Political Director Rick Klein to discuss Bush's presidency. The former president will be laid to rest tomorrow. The flyover will take place over the Bush Presidential Library in College Station, Texas, where the late president will be buried. After the 41st president's funeral at the National Cathedral, his casket and family boarded Air Force One for Texas. Clinton said Bush "treasured" drawings given to him by children in Indonesia and the Maldives. Clinton says Bush will be remembered as a president with a "vision of a world order based on the rule of law and respect for human rights and minority rights." 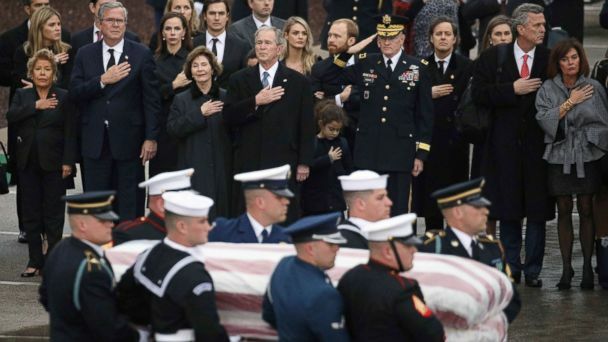 Former President George W. Bush delivered a poignant eulogy of his father President George H.W. Bush. Clinton said his former opponent was "always trying to make sure there'd be more winners" in America. Hundreds of dignitaries gathered at Washington's National Cathedral for a service honoring former President George H.W. Bush. 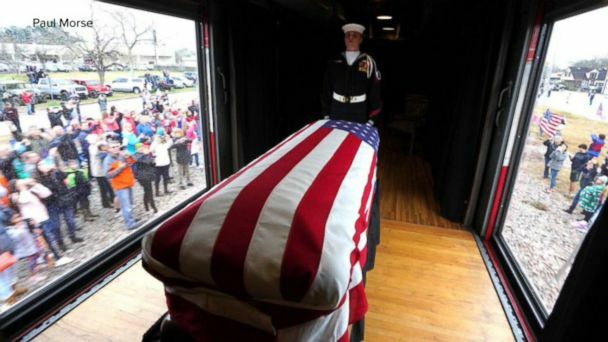 A funeral service for George H.W. Bush was held at Washington National Cathedral. Rev. Dr. Russell Levenson Jr. spoke at the funeral service for George H.W. Bush. The eldest son of George H.W. Bush spoke about his father during a service at Washington National Cathedral. The former senator from Wyoming first met President Bush in 1962. Brian Mulroney spoke at the funeral for George H.W. Bush in the Washington National Cathedral. George H.W. Bush's granddaughter spoke at Washington National Cathedral. Lauren Bush and Ashley Walker Bush deliver readings at the former president's funeral. The president and first lady attended services at the Washington National Cathedral. Canons fired and "Hail to the Chief" played as the former president's body was taken from the Capitol Rotunda. One of the late president's greatest accomplishments was signing into law the Americans with Disabilities act in 1990, and many people who've benefited paid their respects in Washington. Children pay their respects and reflect on a presidency that happened decades before they were born. The former president will honor his father, George H.W. Bush, as family and world leaders gather to honor the 41st president. ABC News' Mary Bruce reports from Capitol Hill as the last visitors walk through the Rotunda to pay their respects to the 41st president before his state funeral service. All living U.S. presidents will come together at the National Cathedral for the funeral of the 41st president, where his son, George W. Bush, will deliver a eulogy. Bush signed the Americans with Disabilities Act, a landmark law that prohibits discrimination against people with disabilities, which affects people like Smith. The family stopped by Tuesday night as visitors continued to pay their respects to the former president. Paul Smith's life was changed by a car accident 20 years ago. The Americans with Disabilities Act, signed by President George H.W. Bush, made his trip to D.C. possible. Donald Trump and Melania are expected to meet privately with the Bush family today at Blair House. The 41st president will lie in state in the U.S. Capitol Rotunda for final honors before burial in Texas. 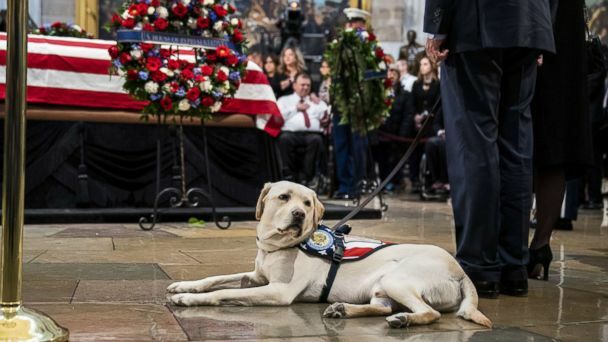 The former president's final journey to Washington began in Texas, with his family members, service dog and secret service detail.